For winning the Sprint Nationals, must be heading towards some kind of record for number of times you can get your name on the board in a year! I’ve put all the results into HALS to date and published them on the web, if you have any queries with any of them, please see me after sailing over the weekend to address them. Rules: Racing will be governed by the Racing Rules of Sailing, the prescriptions of the RYA, the class rules, except if any of these are changed by these sailing instructions, the Thorpe Bay Yacht Club Open Meeting Sailing Instructions and the Supplementary Sailing Instructions. Eligibility and Entry: The regatta is open to boats of the classes stated above. Those eligible may be entered by completing an entry form available in the clubhouse main bar area prior to racing. Scoring: Each boat’s series score shall be the total of her race scores, with her worst score discarded if five or more races have been completed. If only four or less races are completed, a boat’s score will be the total of her race scores. Car Parking: Cars should be parked in the Southend Corporation Car Park adjacent to the boat park – TBYC car parking stickers will be made available. Accomodation: Camping will also be available in the corporation car park No cars in the boat park please. Food and Bar Service: Food and drink will be available in the clubhouse on both days. Menus and specials boards will be on display in the clubhouse main bar area along with the times that food will be served. 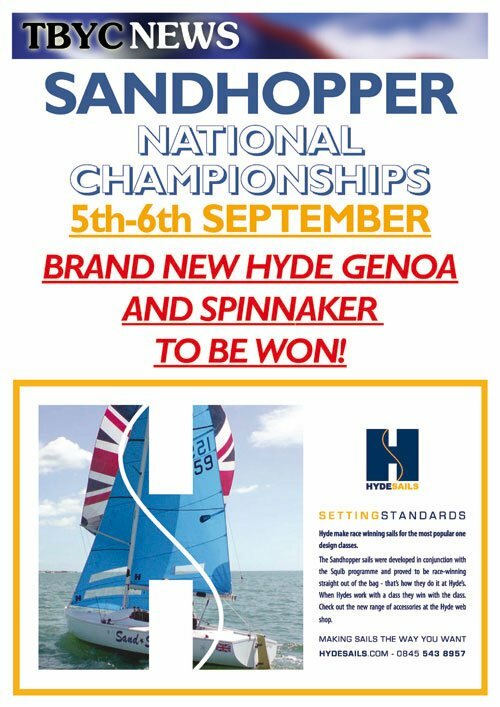 Don’t forget the Sandhopper Nationals on 5th/6th September!